This is Sprocket, a Golden who went from worthless to priceless in the minds of many due to the help and work of Lori Whitwam, chapter director for Therapy Dogs International In October 1997, Lori got a call from Agnes Rambeck of Retrieve a Golden of Minnesota, asking her if she wanted to foster a dog named Parker. Lori had expressed an interest in fostering & was thrilled to accept. When she met with Agnes at a pet supply store to get Parker, "he came out of the car in a flurry of scrambling paws and a wildly whipping tail." Lori, of course, began to wonder what she had gotten into! Parker had been left out in the yard all the time at his old home, and was easily able to get out of the yard. But, his owners refused to bail him out of the pound, so he became a rescue dog. Lori already had her own resident Golden, Ripley, a Golden with his own page, Ripley's Retrieve-It-or-Not. And he wasn't sure what to make of this intruder. Lori says, "Ripley played "border collie, trying to herd this dog away from me at every opportunity." She was anxious to place this foster boy, so that she could get her household back to normal, and soon had an applicant that seemed perfect. They wanted to do obedience and agility with Parker, were putting in a fence, and came to meet him and adored him. Unfortunately, when Lori and Parker went to their home to visit, their seven cats were not about to let him take residence. But, it really worked out okay as Lori's family had realized that they were pretty attached to the "big lug" and decided to adopt him themselves. They changed his name to Sprocket & enrolled him in obedience, and "he was a natural." With little effort, Sprocket got the blue ribbon for best dog in the class, and got his Canine Good Citizen certificate with a perfect score. 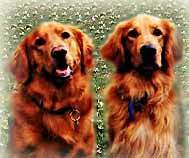 As Lori's Golden Ripley (shown on the left next to Sprocket) had already been a therapy dog through Therapy Dogs International for two years, she believed Sprocket would also do well in this field. Lori says that although Ripley is good for the job and enjoys the attention, he "doesn't come out of himself as much as Sprocket, who is right out there enjoying everyone." She knew that Sprocket would be a super therapy dog, and tested him at a recent TDI evaluation. He did wonderfully, and they are now waiting for his credentials to come back so that he, too, can begin brightening other people's lives as much as he has brightened theirs. Lori says, "There was a time in his life when Sprocket was considered worthless. He came within hours of extermination, but was saved thanks to Golden Retriever rescue. Now he is without a doubt *priceless* and has so much to share with the world. I'm so grateful that he has had this chance."